Status Quo have announced that they’ll radically cut back their touring activities throughout 2018. They’ll only play a select series of summer shows and festivals in 2018 – and that means for the first time in around 30 years there will be no traditional winter European tour or Christmas shows in the UK. In light of the news, the previously announced concert that was scheduled for November 3, 2018, at Zurich’s Hallenstadion has been rescheduled for October 6, 2018, and will be the final Quo gig of the year. Tickets for the original show will be valid for the new date. Francis Rossi says: “This year has been one of change and reassessment following the sad death of Rick Parfitt. Although Rick had already retired from touring for six months before he died, it was still a major shock and my immediate reaction was to honour existing contracts and then knock it on the head. 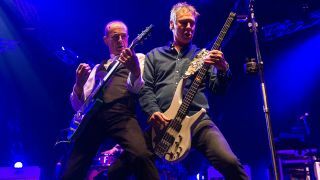 “However, since then I have become increasingly confused as I realised just how much I was enjoying touring with two vibrant young guys in the band in guitarist Richie Mallone and drummer Leon Cave. “They have given us old guys a good kick up the backside and while it could never be the same as with Rick in the band, it is different now but in an exciting and vibrant way that I can’t fully explain. The upcoming Australian dates and the Plugged In: Live And Rockin’! UK tour will be the only opportunity for fans to see the band in smaller and more intimate venues for at least two years. As a tribute to Parfitt, the band will include two of his best-loved songs, Don’t Drive My Car and Little Lady in their live set lists going forward. Led Zeppelin: Classic Rock Special Edition - in the shops now!